Okay, so I'm writing this as it's been a pretty hazy discussion on the internet, so I'm hoping this can dispel some myths and misconceptions. As you've all heard, Google has partnered with KitKat for the namesake of the next version of Android... 4.4 will be named KitKat. To that end they've announced a contest. Kitkat is having a field day on Google Plus teasing us, but also reminding us that if you go and buy a Kitkat you can enter into the contest. Brilliant marketing. You can either win a $5 Play credit or potentially a Nexus 7 (2013). The problem is that in the US Kitkat is 'owned' by Hershey, and in Canada it's 'owned' by Nestle. So 2 different parent companies, plus the fact there's different 'contest laws' in our countries means there's some confusion. For weeks our +Android Coliseum team have been scouring looking for the special wrappers that will enter us into the contest. Once folks started finding the wrappers, we immediately started to notice the difference. 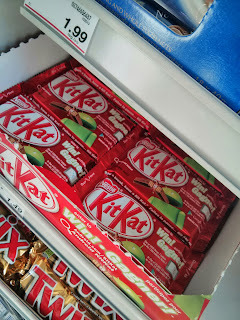 For our US partners, they have to buy the specific wrapper version of the candy bar and open it up to get a special code, then go to www.android.com/kitkat and enter it in. Rules are a bit hazy, but it sounds as though if you win once for that email address, that's it. Not sure 100% tho', but that's just for the US, so it doesn't matter for us Canadians. Read through the rules, and you'll see that all we have to do is enter the UPC of the bar. No opening required as the UPC is on the outside. And we can enter up to 5x per day. Granted, we need 5 different codes to enter each time for that day. Go and find 5 different UPCs and then remember the numbers... enter them each in separately with your email and you're good. Just tedious. As you're allowed 5x per day, just do the same thing the next day. It's the same codes, so it's not like it knows if you bought 5 new bars or not. The winning seems to be a random set somehow. So, just keep trying. Some of our readers have said it takes time, and patience but they've collected a couple of the $5 credits, and I've heard of even on Nexus 7 winner (dammit... not me). Some folks out there have a database of all the 'acceptable UPCs' and so you won't even need to leave your house or go to the store to enter. Plus, if you've got multiple Android accounts (or your wife, or kid's tablet, or GoogleTV), then those could enter 5x a day as well.